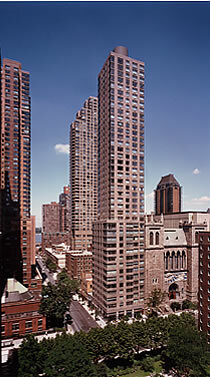 This 41-story tower with 133 condominium apartments, completed in 1999, is built using the air rights from the adjacent 1885 St. Paul the Apostle Roman Catholic Church. In order to be aligned with the parapet of the church towers, the new building is set back after rising 14 stories. Decorative patterns of brick and granite bands complement the older rusticated stone. The north-facing curtain wall (overlooking Lincoln Center) reflects the sky and the old slate roof, helping the church retain its strong presence.